ALLIANCE, Ohio — The Marlington FFA chapter held its meeting Jan. 8 at 7:30 p.m. in the Horticulture Building. The alumni also met at that time. 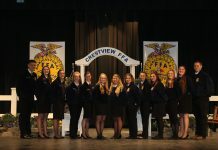 Items on the agenda included livestock judging contest, made for excellence, National FFA week, annual cheese sale and the spring banquet. Alumni of the chapter and anyone wanting to sit in on a meeting are welcome to attend.